The Scalex 890 Self-Contained Piezo Scaler has all the cleaning power you need with performance guaranteed for one full year. 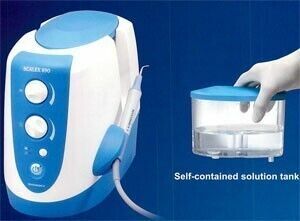 Self-contained solution tank allows for convenient portability and the addition of medicated solutions to scaler therapy. State of the art Piezo Electric Self- tuning And load adjusting technology for smooth and effertless operation. Innovative water cooled circuitry designed for greatter stability during operation.